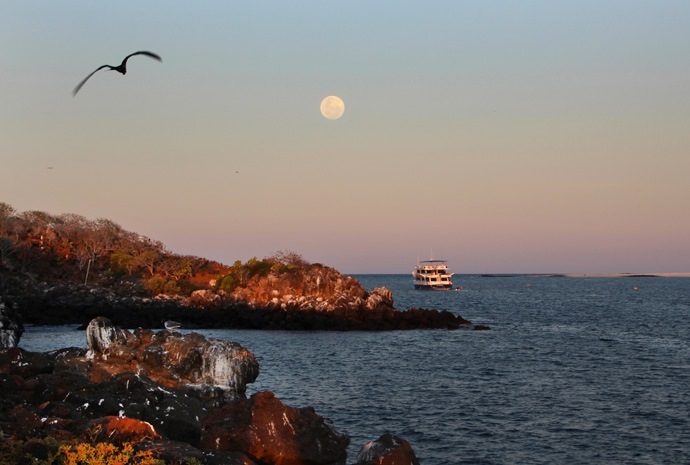 13 major islands and 7 smaller islands make up the beautiful Galapagos archipelago, an area swarming with an abundance of wildlife and stunning natural beauty. From lava tunnels and volcanic caverns to giant tortoise reserves and huge sea lion colonies, there is something remarkable to see around every corner. 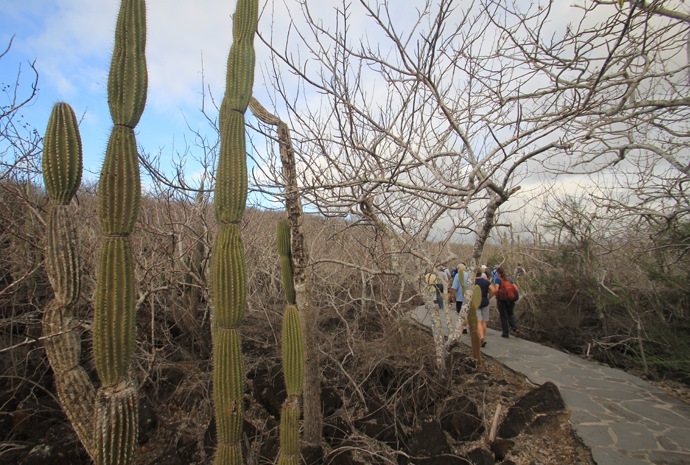 Below we offer a brief insight to the wonders of some of our favourite islands but should you require more information about a particular island that you would like to see on your Galapagos trip then please feel free to contact us and we will be delighted to share our knowledge. The island of Santa Cruz is reached by air via the adjacent Baltra Island. It is the most populated island and is right in the middle of the archipelago. The main town is Puerto Ayora on the south coast and this is where many of the cruise boats embark passengers. It is a friendly, bustling town with hotels, restaurants and shops. 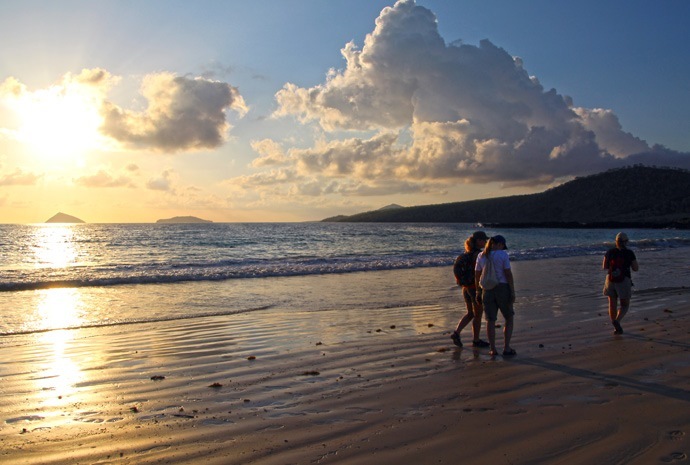 Within walking distance is the beautiful Tortuga Bay, with its long, white-sand beach. 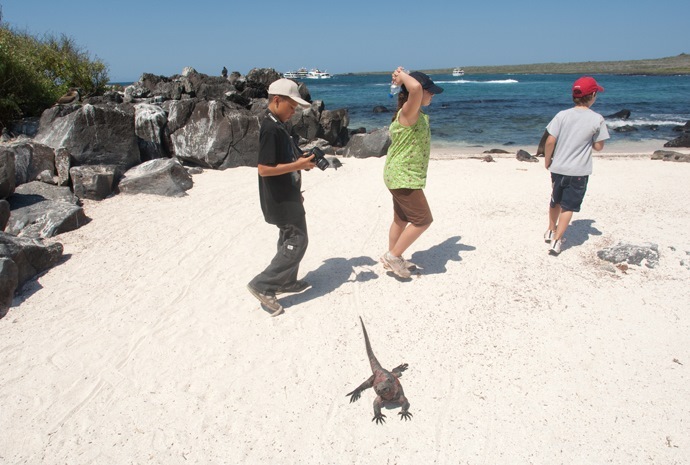 Here, many visitors see their first marine iguanas, which are prolific on the beach and in the mangroves. Also close to town is the Darwin Centre, where visitors learn more about giant tortoises. In the hills can be found a giant tortoise reserve where visitors can walk amongst these amazing creatures. Close by are lava tunnels and ‘gemelos’ where the roofs of volcanic caverns have subsided to form deep depressions. This area also supports an endemic Scalesia forest and many species of birds. The highest points on the island are Cerro Crocker and Puntudo, where there are magnificent views in all directions. 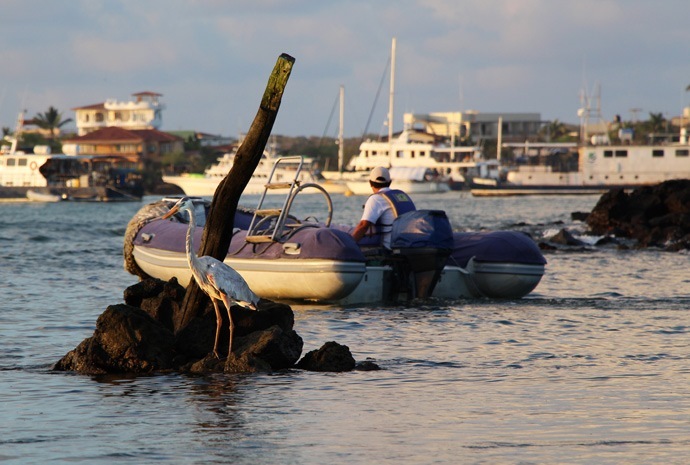 Flamingoes can be seen at El Garrapatero Beach and white-tipped sharks in the shallows at Los Perros Beach, reached by water taxi from the Port. Another volcanic island where all the marine fossils in the archipelago have been found. There are approximately 600 land iguanas on the island, which is reached by boat from Itabaca Channel in the north of Santa Cruz. Located between the islands of Baltra and North Seymour, this reef of rocks and coral (the result of an uprising) is only 160 metres across at its narrowest width. 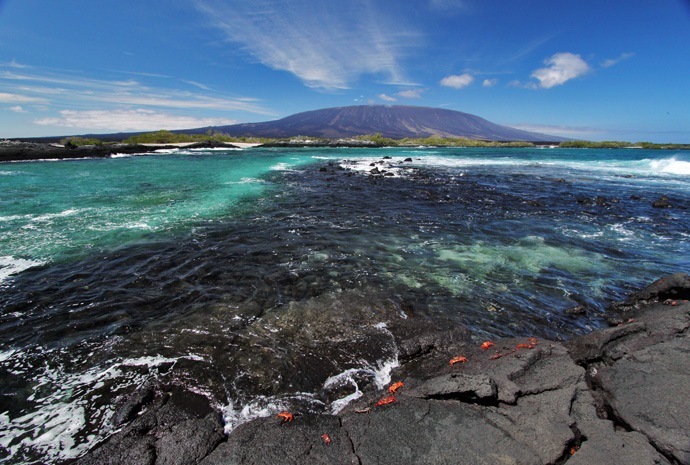 This island has one of the largest populations of sea lions and is home to many shorebirds. There have been occasional reports at this site of orcas feeding on sea lions. This small island with steep cliffs was formed by rising lava and is now covered by Opuntia cacti. 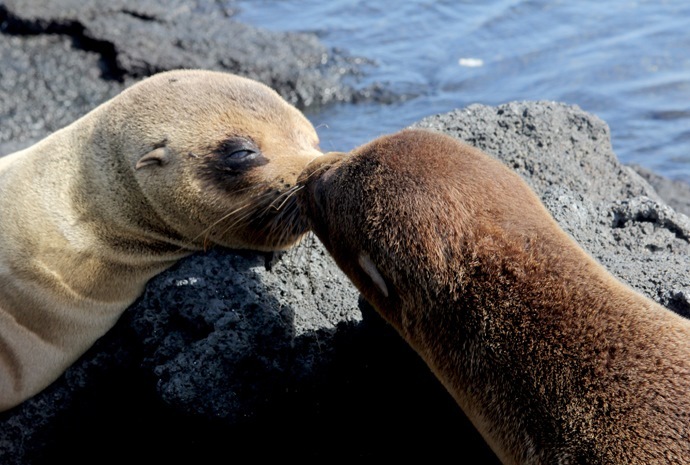 It is also home to one of the largest sea lion colonies as well as colourful yellow and red land iguanas. The most characteristic plant is the Sesuvium. During the rainy season its colour is a greenish to yellowish tone, and in the dry season (end of June through to January), a bright red. Lots of birds to be seen over the cliffs including Audubon’s shearwaters, Nazca and blue-footed boobies, swallow-tailed gulls and frigatebirds. Also home to a large sealion colony. 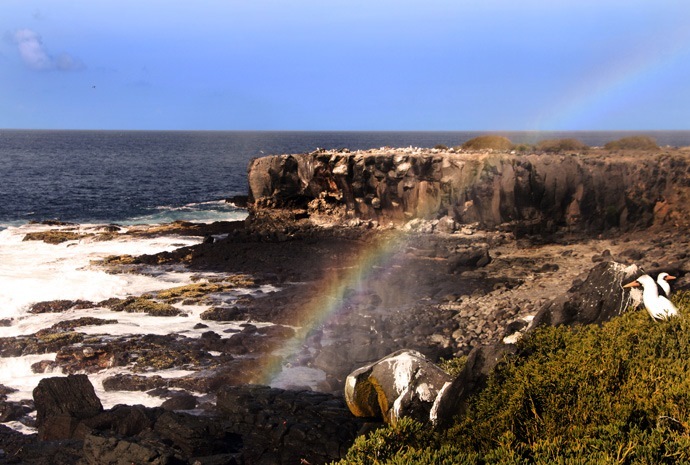 Santiago Island has a narrow, steep-sided point of land which provides an extraordinarily beautiful landscape complete with cliffs and pinnacles where hundreds of marine birds rest. During the 17th and 18th centuries, pirates used this site for maintaining their ships and supplying themselves with fresh water, meat, and firewood. Rabida Island is one of the most colourful and volcanically varied islands in the archipelago and a great snorkelling site. Its famous maroon sandy beach and stunning lookouts provide wonderful landscapes. The island is a birdwatcher’s delight. Some of the rarest species are in abundance such as nine varieties of finches, large-billed flycatchers, Galapagos hawks and brown pelicans. On the north side of the equator, Genovesa Island contains an abundance of frigatebirds, tropicbirds and other sea and terrestrial birds. 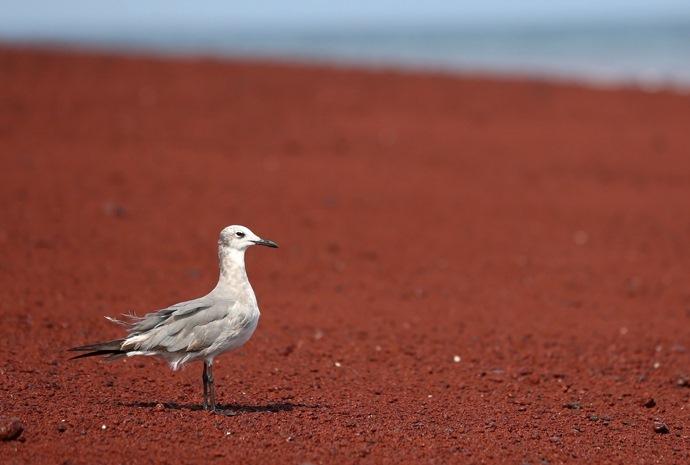 Behind the small beach filled with nesting areas for frigates, red-footed boobies and swallow-tailed gulls are a number of tide pools. There are two main landing areas on the island and the other is reached by climbing steep steps up the cliff. Here are more nesting frigate birds and Nazca boobies. Short-eared owls are also seen. So called because of its shape, this is a great place to examine lava tubes and lava flows. Galapagos penguin are often seen in the waters here. It is also somewhere to enjoy snorkelling from the beach. Home of the famous Pinnacle Rock, Bartholomew consists of an extinct volcano with a variety of red, orange, black and even green volcanic formations. 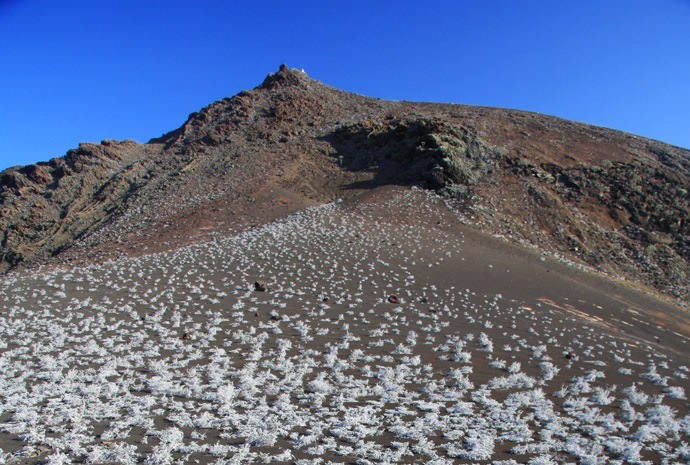 A trail of stairs leads to the summit of the volcano boasting one of the best views of the islands. 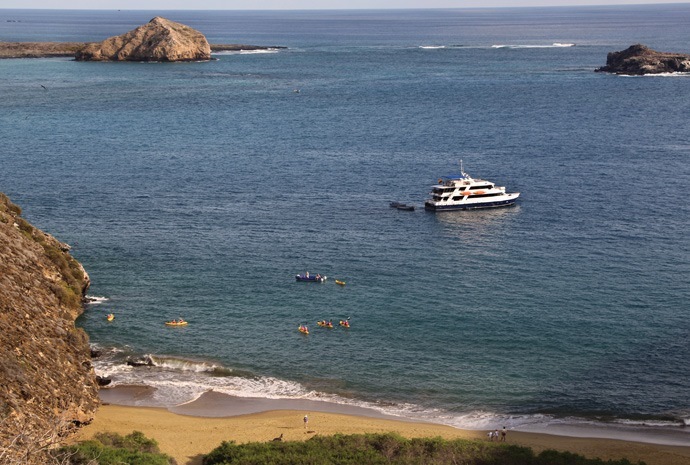 The beach is perfect for snorkeling and possible sightings of the Galapagos penguin. Also seen are lava cactus, reef sharks, rays and colourful fish. The archipelago’s largest island, Isabela, was formed by the joining of five young volcanoes. While these volcanic regions contain extensive lava fields and little vegetation, the southern highlands and various other regions are covered by dense vegetation including the unique red mangrove. Isabela Island is also home to many native Galapageños living in the island’s largest town, Puerto Villamil. It is a great island to explore on land-based itineraries to see not only volcanoes, but also giant tortoises, large marine iguanas, penguins and the rare flightless cormorant. No foreign species have ever invaded Fernandina Island, and therefore it is one of the world's most pristine island ecosystems. The volcano “La Cumbre” dominates the landspace with lava fields reaching the ocean. The island's highlight features the flightless cormorant nesting site. 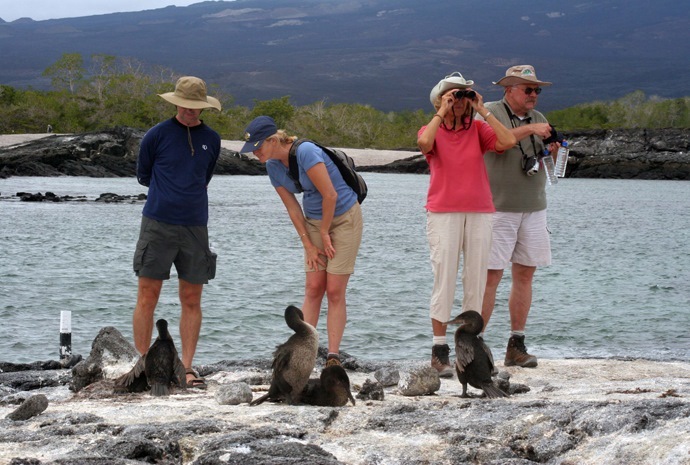 This area provides a great opportunity to see the Galapagos hawk as well as penguins, sealions and active volcanoes. Santa Fe is home to the small picturesque bay and anchorage on the island’s northeast coast. The bay has two visitor trails: one leading to a scenic viewpoint atop a cliff, and the other spanning from a small beach to a tall prickly pear cactus forest. There are land iguanas here. 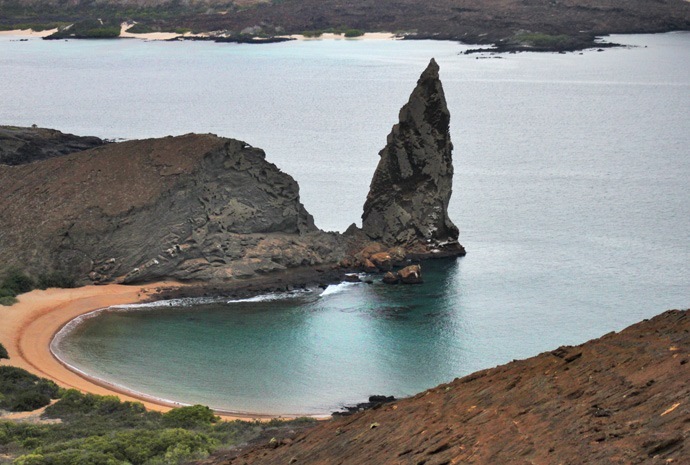 Floreana, officially “Santa María,” is located at the far south of the archipelago. Famous for its Post Office Bay and the nearby Devil’s Crown formation, the island is also known for its flamingos and sea turtles. 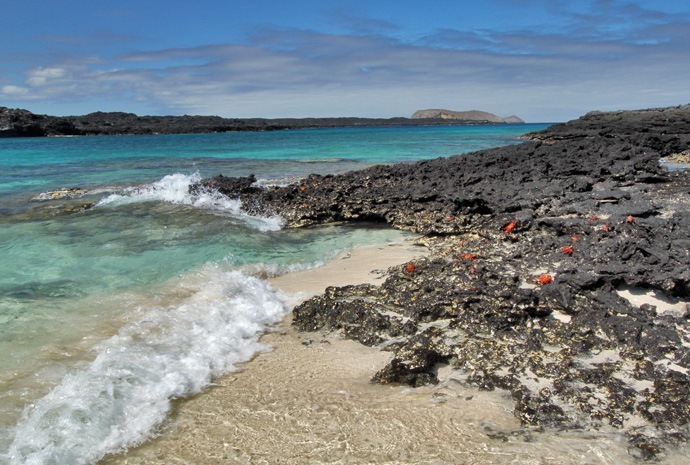 Snorkelling around this area is one of the best in the Galapagos. Española Island is located at the extreme southeast of the archipelago. Relatively flat with small hills, a group of geologists found signs of volcanic activity in the 1980s. 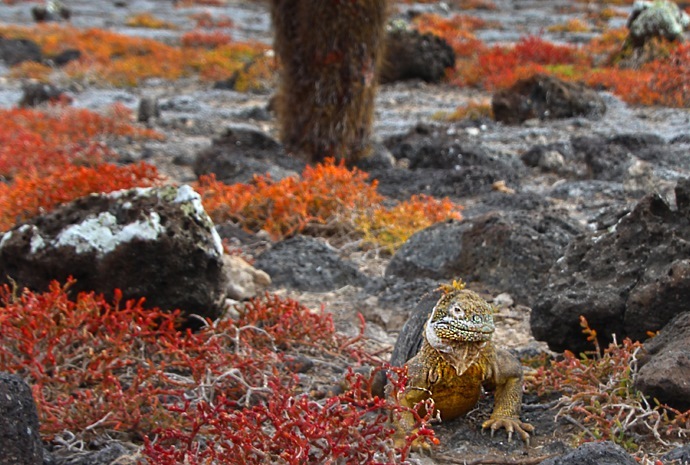 Vegetation on the island includes many thorny plants and native animals including the waved albatross, marine iguanas, and lava lizards. San Cristobal is home to the small town of Puerto Baquerizo Moreno, and the Junco Lagoon, located 700 metres above sea level. El Junco has been the object of a study in which the sediments on the bottom of the lake were analysed to uncover information about the vegetation and climate of the archipelago thousands of years ago. This is the only island where blue-footed, red-footed and Nazca boobies plus frigatebirds can be seen nesting in the same area. 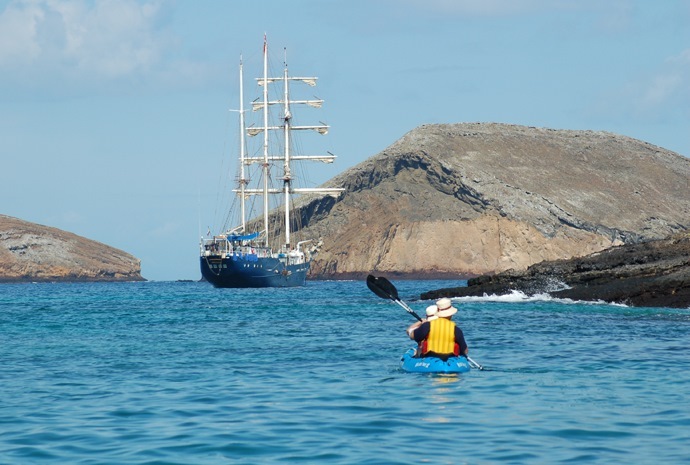 Off the island is the distinctive Kicker Rock, a superb place for diving and snorkelling – green turtles, rays and Galapagos sharks along with thousands of fish.